Ok, not quite done. 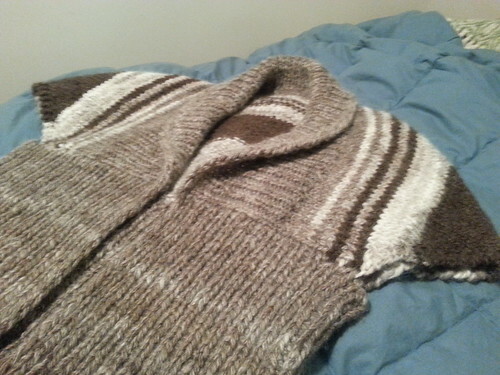 Still needs a button or some kind of little closure thingee. 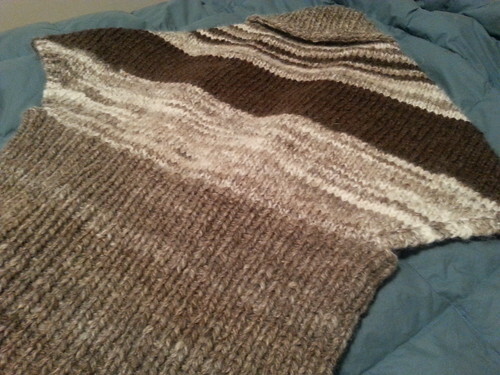 But it’s knitted, washed, blocked, and dried. And I think it’s really cute. But I’m not really in the right mood to model anything right now. So now I have to decide if I want to knit another one while it’s still fresh in my mind, or shift gears and do something completely different! Because I hate being without something to knit on breaks, and on the bus and such. Knitting is sometimes the only thing that keeps be from losing my mind while using public transportation. Powerful medicine for the bus commute. Oooh, I REALLY like that greeny/teal skein! I LOVE the look of your sweater, but wasn’t impressed with some of the others when I looked through the pattern’s Ravelry projects. Trying to decided if I would wear something like this….